As the Ebola outbreak continues to spread, there is some hope from those who survive it. In Kenema, in eastern Sierra Leone, a survivor conference was held for the first time. The goal was to counsel survivors and look at ways they can increase awareness about the disease. Music blared through a small church as 36 Ebola survivors danced to celebrate the fact that they have beaten the deadly virus, for which there is no vaccine. The survivor conference was organized by the Ministry of Social Welfare, Gender and Children’s Affairs. Ebola Cases and Deaths in West Africa as of October 14, 2014. The ministry and various non-governmental organizations want to encourage the survivors to counsel other Ebola patients and teach people in their communities more about Ebola and prevention. Matthew Dalling, UNICEF chief of child protection, said survivors often face a social stigma. “They go back into communities and they are ostracized, and are told to leave. One or two survivors I met are renting [homes] in Kenema city because they cannot go back to their rural villages," Dalling said. "What we want to do is find a way to get them to go back and become helpers and advocates, champions. We really see them as heroes,” he said. Nurse Fatmata Feremusu Sesay contracted the disease while tending to a patient who vomited on her. She said because the material of her nursing gown is so light, the vomit managed to get on her skin. Ebola is only spread through direct contact with bodily fluids of an infected person. Sesay said she is grateful to be alive and that she wants to become an advocate in her community, because some still do not believe Ebola is real. ​“There was a rumor that, they [the government] were giving us [nurses] a huge amount of money and we are the ones killing the people, that we are injecting the people, that we kill the people,” Sesay said. It is those kinds of rumors that Ebola survivor Dauda Mohamed Fullah also wants to stop. 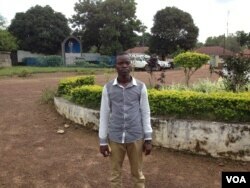 He works as a lab technician at the Kenema government hospital and has faced rejection from people because he had Ebola. But Fullah said the hardest part is that most of his family also got infected and did not survive. “I think about them sometimes. I have nightmares, even last night I had a dream I saw my father and I could not bear it. I wanted to go to him, but he rejected me, said, 'No.' So, I started crying in my dreams and I woke up with tears in my eyes,” Fullah said. Many survivors have similar harrowing experiences. Jamilah Jawara lost her twin babies to Ebola. "It was June 17th. I lost my two kids, they were in my hands, the first one died, the boy,” Jawara said. Her daughter died shortly after. These experiences can traumatize survivors. World Health Organization spokesperson Dr. Margaret Harris said the idea of having survivors work in communities and with patients is good, but they need to also make sure they are ready and should not feel obligated. It is also important to still take all necessary precautions, Harris said. “For instance, people are talking about survivors being perfectly safe from being infected again, well we have not done antibody levels [tests on them]. We know they have survived, but we do not know they are 100 percent protected, and we have to make sure they are medically safe,” Harris said. There are 634 survivors in Sierra Leone as of October 19, according to the Ministry of Health and Sanitation. UNICEF's Dalling said there will be another 13 similar conferences across the country for survivors, and officials hope to start rolling out a more concrete plan as soon as possible.